Media: Soft, glossy, colour covers; A4 portrait format, printed in black and white on 68 good quality, semi-gloss pages. Includes 4 pages of colour artwork and many black and white photographs. Advantages: Excellent examination of this iconic aircraft by the people who flew and maintained them. Good range of photographs, with many not seen by this reviewer before. Written by someone who actually flew the 10 ton 'beast'. In my 2003 Hyperscale review of the '4+' book on the Wyvern, I said that it was probably one of those aircraft you either love or hate. Well it would seem that there are a lot of modellers out there who must love it, as four new kits (two S.4's in 1:48 scale, plus an S.4 and a TF.1 in 1:72 scale) of this enigmatic machine have since appeared, and they have literally leapt off the shelves. Fitting then, that Ad Hoc's first title in its new 'From the Cockpit' series, covers this fascinating and iconic British machine. 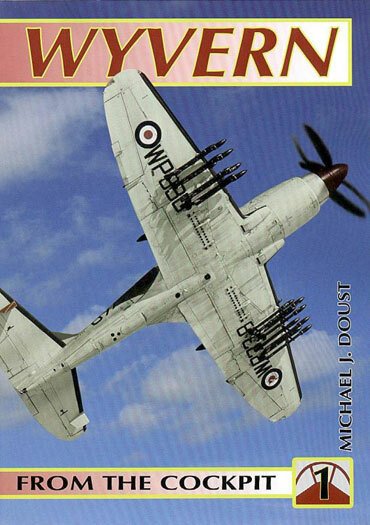 Author Michael J Doust, actually flew Wyverns from RNAS Ford (Sussex, UK) from 1955 onwards, so is well placed to comment on the aircraft's performance, handling and operational history. His text is printed in two-columns-per-page format, interspersed with many photographs, either as inserts or forming the frame or background to the text on each page. Although the many excellent photographs are only in black and white, their subject matter more than makes up for that. Some have inevitably appeared in print elsewhere, but many have not been seen by this reviewer before. In particular, there are some very useful shots of the Wyvern with the cowlings off, indeed, this is the first time I have actually seen the Python engine exposed when attached to the aircraft, rather than as a solitary exhibit in a museum. There are also four pages of colour artwork (profiles), including a more extensive two page spread covering the author's own aircraft, as flown from HMS Ark Royal in the Summer of 1957. Scattered throughout the book, in accompaniment to the author's own text, are separate accounts written by other pilots or groundcrew of the period. Together, these provide a useful alternative viewpoint on various aspects of the Wyvern, in both front and second-line service. Descriptions of the aircraft from the ground crew's perspective, often a neglected area of study, are one of the delights of this book and it is to be hoped that this will be a continuing feature of this series. One could go into a lot more detail here about the specific chapters and anecdotes recounted, but this would spoil the fun and lead to a very long review, suffice to say that amongst the many interesting subjects covered, there are also the usual number of 'box-outs', containing pertinent data on performance, squadron lists, etc. This is an excellent and extremely useful book, bringing together a wealth of photographic, technical and operational detail. Crucially, it also adds the personal detail and feeling for the Wyvern as an integral part of a fighting machine, which was (understandably) missing from the '4+' book, making it an ideal companion to that publication if you already have it. This book bodes well for the future of the rest of this series, and with 'From the Cockpit No.2 SCIMITAR' to be next off the presses, Fleet Air Arm aficionados look like being very well served indeed. Highly recommended.